I'll let you in on a little secret. In the fall ole' Average Joe was getting bored with shooting. I didn't care if I shot well and couldn't get motivated to even go to the range. Then one Saturday at Bill's Gun Shop and Range in Robbinsdale, MN I was looking at the shelf of CZ pistols. This thought hit me "why not go back to the pistol that really peaked your interest in shooting because it gave you such sweet groups". Let me explain what this means. When I lived in Chicago and Los Angeles I got to the range maybe once or twice a year, fired one box of each caliber I brought with me and went home hardly impressed with my shooting skills. In 2003 when I moved to Boise I got to the range a little more often (a lot more often) and my skills began to improve (I was no longer missing the silhouette at 21 feet). I continually made the trek between Cliff's Guns, Safes and Reloading, Buck Horn Guns, and the Boise Gun Company and began to get to know the staff's very well. One Friday evening in the Spring of 2004 I stopped by the Boise Gun Company and as I maneuvered through the rest of the people in the semi-automatic pistol corner Paul came over. Paul was the maitre d' over the 3 cases of semi-automatic pistols. He put into my hands a brand new full-sized CZ 75 BD. It felt really good in my grip. The stocks were black checkered hard plastic with palm swells and this pistol felt as good as any pistol ever had. "But Paul" I said "This has a decocker and you know I hate double action pistols" thereby affirming everything I had ever seen Col. Jeff Cooper write. He nodded and then said "This is a world class pistol and Colonel Cooper liked it ". I still wasn't convinced because I had owned a CZ pistol before. About six or seven years earlier when I lived in Chicago...back in my fifty rounds a year days, I looked at two handguns over my lunch hour for about a week. I couldn't decide whether to buy a purple anodized Taurus model 85 .38 special with a compensated barrel or a nickel plated CZ 75 compact with black plastic grips. I decided on the CZ but after one trip to the range I decided it was inherently inaccurate and sold it back to the shop and bought a Kahr P9 (which surprisingly also turned out to be inherently inaccurate). My denial about my own shooting abilities knew no bounds. Anyway, the next day I went back to the Boise Gun Company shortly after opening and, as usual, the shop was teeming with customers. When Paul saw me he was already helping two or three other customers but he looked me in the eye and said "I know what you're here for" as he pushed the federal form and a cheap Paper Mate stick pen in direction. I made my purchase and took the CZ 75 BD over to the Impact Gun Range (geez, I'm doin' a lot of free advertising for gun shops that are almost 1500 miles away). The CZ clover-leafed my rounds and made me look like I knew what I was doing. My boss shot it and he wanted one. We spent the next Monday morning looking over the CZ-USA website and finally called down to their offices in Kansas City. While my CZ 75 BD was a great pistol it was a full-sized handgun and we wanted something a little easier to carry. Two of their sales people recommended we order their newest and finest pistol, the P-01. We did. The double action trigger seemed a little gritty but the accuracy was as good as my full-sized 75. The next weekend I was back at the Boise Gun Company when I spied a used nickel plated CZ compact. I bought it because it was downright pretty, the price was right, and I figured it surely would shoot better than the one I owned in Chicago. I was kind of half right. It did shoot a lot better but, after checking the serial number against my file of purchase receipts I realized that I had just bought my old Chicago pistol back. But I had fun with the purchase. I swapped the slides between the nickel plated compact and the black poly-coated P-01 and then told the clerks and other shooters at Impact Guns that I was a part of an elite CZ consumer consortium and was testing possible prototypes for the home office in Kansas City and...oh, one or two out of the fifty or so people I told actually bought it. But let's get back to the gun at hand, the CZ 75 D PCR and I'll address the most obvious thing first. I replaced the grips. This pistol comes with checkered rubber grips that have nice palm swells and they work great. However, I wanted to make the grip slimmer and these VZ grips fit the bill perfectly reducing the width from 1.38 inches to 1.18 inches. Trigger Pull: Double Action-8.14 lbs. Single Action-4.15 lbs. This photo clearly shows the front and rear sight configuration and as well as the grip palm swells. I want to reiterate that the rubber grips worked fine I just wanted to slim them down a little and a little pizzazz to the product. The ergonomics of the pistol is fantastic. The design of the grips and grip frame allows my finger to reach the trigger in just the right spot to ensure well centered hits. While we're talking about the trigger the double action pull comes in at 8.14 pounds does not cause me to throw shots. The single action pull at 4.15 pounds allows me fast follow up shots and the accuracy to put one right over the other and I think this 4 plus pounds of trigger pull is just about right for a single action pull. Far too often I have shied away from carrying a 1911 simply because some of the more expensive ones have very light trigger pulls and I find myself with an accidental discharge during recoil. Now getting back to ergonomics the placement of the decocker is perfect for my reach and I can manipulate it easily without shifting the pistol or changing my grip. One of the other very noticeable features of CZ pistols is that the slide rides inside the frame. Because of this the portion of the slide inside the frame means there is less of the frame exposed when you need to grasp it to rack the slide or clear jams. The good news is that I didn't have any jams; however, in the heat of battle things always go wrong. But there are some advantages of the inside-the frame slide set-up. First of all it allows for a higher grip which helps control recoil therefore helping your accuracy and follow-up time. It has also been said that the slide inside-the-frame set-up helps accuracy as in the design of the exulted SIG P210 which was once thought to be the most accurate pistol in production. As for accuracy? I took this pistol to Chicago in October to shoot it when my Chicago team qualified. I ran the course three times with the CZ 75 D PCR and out of a possible score of 30 points I racked up two 29s and a 30. In fact I loaned it one of the team members who carries a SIG P226 as a part-time police officer. He shot a 28, 29, and a 30 with it and felt it was every bit as good, if not better, than his larger, heavier and twice as expensive SIG. So let's see some targets! Part of the reason that CZ pistols work so well for me as it did my team member is that the pistol fits well. I have written and talked about this before, most recently on the Gun Nation when we discussed Grant Cunningham's new book. The proper fit of the pistol in your hand is very important. These pistols fit my hand well but if you have smaller hands they may not fit yours. I will end with a challenge: the next time you are in a gun shop that stocks CZs, ask to examine one closer. See how it fits in your hand and see how well you can reach the controls. For my sized hands the CZ pistols fit so well that I don't have to think about how to operate it as it seems to become an extension of my arm and during the intensity and confusion of a shooting incident that fit makes your mission just a little bit easier. Hey AJ, Are those VZ grips the DIAMOND BACKS BLACK DESERT SAND G10? Just picked up this pistol yesterday and waiting my 10 days to hold it again. Love the look of those grips. Thanks for a great review as always! You pushed me over the edge on this one. Yes they are. You will love this pistol. I'm sold. One thing: it's piqued my interest and not peaked. Otherwise, perfect. I'm an English major. Sorry. Pet peve. 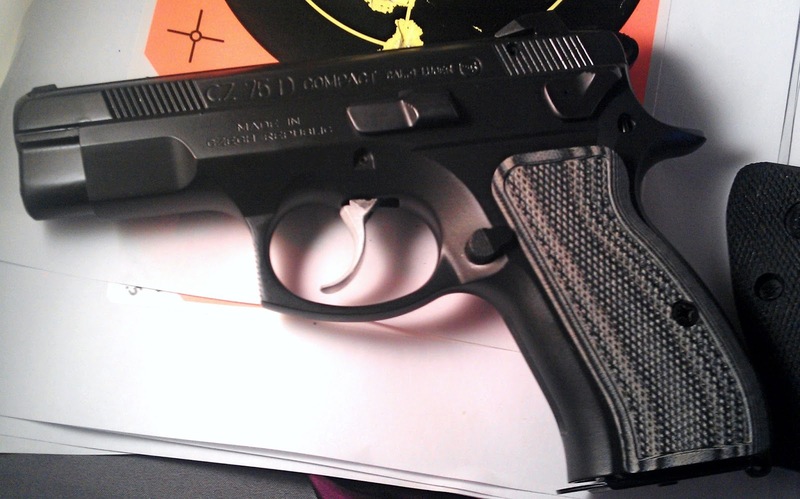 I recently purchased a CZ75 D Compact PCR. To me other than the grip being a little too large it is perfect. And some new grips helped some. It is now my CC gun and I can't think of any negatives. The ergonomics, quality, dependability [500-600 rounds with zero issues], cosmetics are all top notch and it will stand up against pistols costing several times as much. If it were offered in single stack it would be my wife's CC as well. 100% happy with it. I have an SP-01 Shadow Target and a Tactical Sport. And I want more. I love CZ. CZ75 D Compact PCR come w / too strong of a recoil spring as wouldn't work right w many light HP or target ball ammo. Sent to CZ 2x and still wasn't fixed as they left in the heavy, believe 17# spring. They did some polishing, extractor work (installed heavier spring here too) ! Anyway I put in a aftermarket believe 14# recoil spring and went back to older, lighter extractor spring. Now she's flawless w / everything. Accuracy was never the issue as super accurate. This gun is made for Czech Police so is more than likely why had the stiff springs for their hot ammo I'd imagine. I spent many years in North Minneapolis and frequently found myself at Bill's Gun Shop in Robbinsdale. We moved to SW Oregon in 1992 and could not be happier! 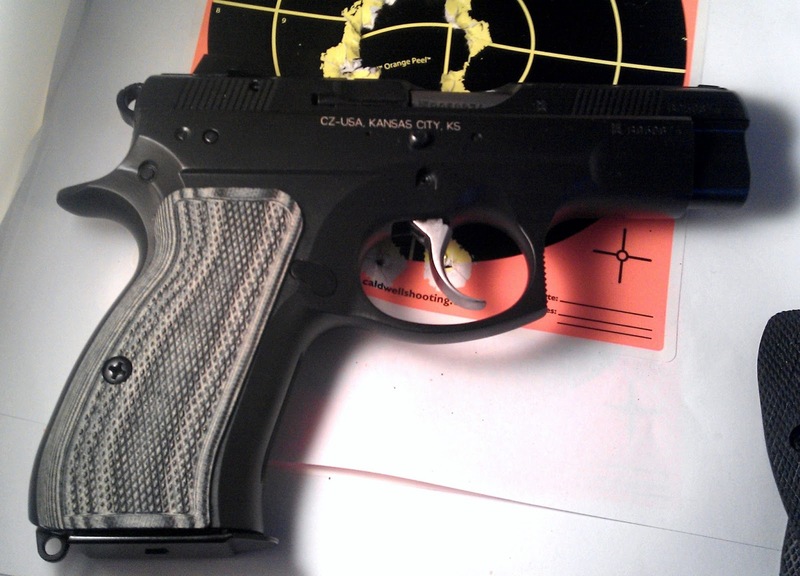 I purchased both the CZ 97B (in .45 ACP) and the CZ75D Compact PCR. What a piece of equipment. The only complaints I had were the stock sights and a less than ideal trigger. I am currently addressing those issues by having the Defensive Carry Package installed and Trijicon night sights by Cajun Gun Works. I will finally have my CCW piece complete! Thanks for your early review to help me find this exceptional weapon.